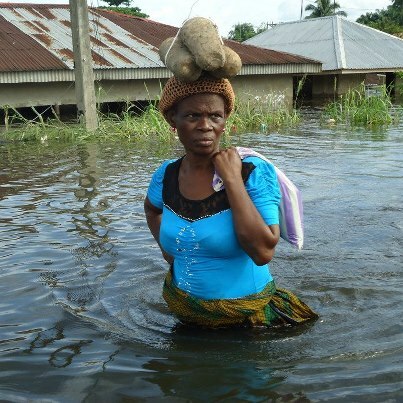 AHOADA FLOOD VICTIMS CRY OUT FOR HELP!!! A normal trip from Port Harcourt, Rivers State capital to Mbiama, the popular commercial town in Ahoada West Local Government Area of Rivers State usually takes about one hour, thirty minutes. That wasn’t the case when Social Action, a Port Harcourt-based NGO visited the area on October 9-10, 2012 to assess the level of damage caused by flood and to document the official responses to the situation by the federal, state and local governments, including the multinational oil companies working in the area, especially Shell. A heavy traffic from Okogbe axis of the East-West Road signaled that something was wrong: the Okogbe-Mbiama road is flooded to the point where only heavy-duty vehicles could pass. Surmounting all the odds and traffic delays, the team’s visit to the inaccessible communities such as Mbiama, Akinima, Akioniso and Oruama revealed that these areas have been submerged, rendering thousands homeless, and without food. Scant media reportage of the situation in these communities was also delaying help from reaching those in critical need. “This flood is the worst our community has ever witnessed since 1954”, says Mr. Adose Simon, a 68-year-old indigene of Oruama. “Flood has virtually destroyed everything we ever had including homes, crops in the farm, fishing and poultry business as well as other petty businesses” he said. At Akioniso, the team met a handful of community people living in a makeshift hut made of sticks and sack bags. The hut currently shelters children at night and serves as a kitchen for the entire community during the day. “The ravaging flood spared nothing… What you are seeing here are all we have for now…We were forced to uproot all the cassava in the farm prematurely so that we could have something to eat after the flood. Our priority is to see that the children are safe and sheltered at night”, 27-year-old Ms. Ruth Budezi told the team. 30 year old Mr. Odiomeya Wurudain, an indigene of Jonkrama 3, popularly called “Jk 3” is a Welder who been forced into okadabusiness. He lost his properties and welding equipment to the flood as his workshop in Oruama was submerged while he was away in Ahoada to buy material for his work. “Before going to Ahoada, I carefully arranged all my things on an elevated stand which I constructed, but now, its even difficult to locate the very spot where my business place stood before the flood. I am helpless; I have no clothes except the one I am wearing now. The situation forced me to switch to okada-riding until I can get help”, he said. At Akinima, the Headquarters of Ahoada West Local Government Area, the story was the same. There was no single building standing except the Local Government Council building which now serves as a camp for the thousands who could not afford to relocate to Ahoada and Port Harcourt city. In all, the team visited three out of the five centres including the community town hall that is under construction. In some of the places visited, they met trapped families who had sought refuge in upper floors of storey buildings. According to Mr. Wisdom James, a second year student of Management Sciences of the Rivers State University of Science and Technology took the team round the village in his canoe, “the problem here is increasing mosquito bites. If help does not reach us in time, more people would die from malaria than the hunger they so much dread. “This is the first time we are receiving relief items from any person, government or company since we moved in here in the last week of September 2012”. He expressed bitterness over the insensitivity of the government and her agencies for not responding to the SOS messages sent to those in authority. Mr. Stephen was particularly angry that the Governor of Rivers State, Honourable Rotimi Chibuike Amaechi turned back upon seeing the flood at Mbiama during a scheduled visit to the area.